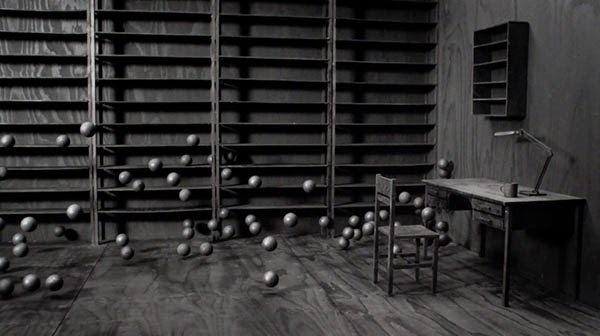 A series of mesmerizing short films based on Levi's drawings which were replicated life-size in wood and with its collapse by an unknown force filmed at over 1000 frames per second. One of the drawings presents an image of an archive room, filled with large structures of cabinets containing more than 1500 neatly arranged icosahedrons. The whole arrangement is held in place by the very structure of the cabinets and the force of gravity, in a fundamental and continuous on-going struggle between the desire for order and the forces of nature. An unknown cause upsets this equilibrium and the cabinets are made to topple over. The symmetrical forms are no longer held in place, gravity takes over, order is turned into chaos. In the film, the drawing has been replicated life-size in wood. All the visible surfaces are covered in carbon powder, and the setting acquires shape only through the reflection of the light. Reality becomes tangible only through the experience of lighter or darker hues, as in a drawing. The falling apart of the structure is filmed at over 1000 frames per second. After months of meticulous preparation, this is the only, and crucial, moment over which the artist has no control. In contrast to the drawing in which the moment of chaos remains an interpretation by the artist – and is therefore inexorably linked to him – the film makes it possible to relinquish all and every form of control. Unpredictability becomes a new factor in this work. The time of the event is stretched; the moment measured in seconds becomes a minute-long occurrence and forms a new reality. Time, because of this massive slowing, seems to no longer affect the process of disruption. The icosahedrons float through the air, rotating, the glistening of the light that reflects on their 20 faces reveals their symmetry in its ultimate form. Entirely free, in search of a new order. With a great feeling of serenity, the viewer experiences how gravity gives these elements their new place.